Yesterday morning we went to see the Golden Temple, a Sikh temple which apparently attracts more visitors every year than the Taj Mahal. We were a little horrified at the thought of surrendering our shoes and socks to bathe our feet before entering the temple – particularly since we’ve been so diligent in wearing thongs in showers and rarely letting our bare feet touch outdoor surfaces! 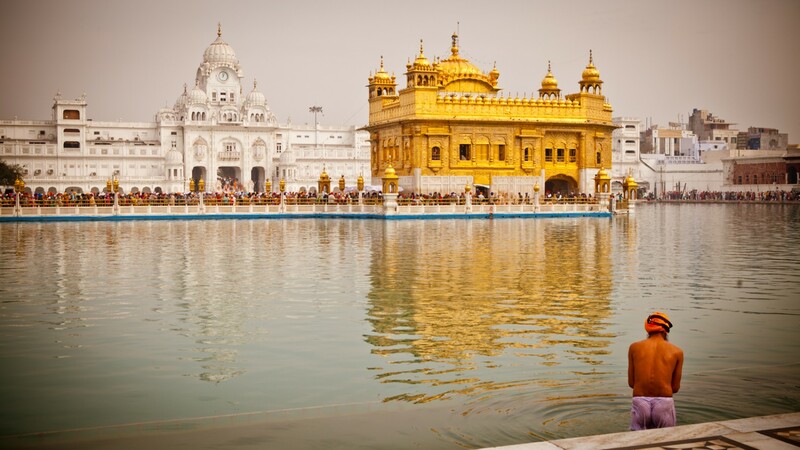 The sight of the temple and the huge number of visiting Sikhs was well worth it though. The contrast of the golden walls of the temple against the white marble of the courtyard and buildings was quite striking. Upon entering we followed by example and made our way around the courtyard in a clock-wise direction, watching as some people stopped along the way to pray while others took the opportunity to bathe in the pool of water surrounding the temple. Lots of people stopped us as we made our way around, explaining the various aspects of the temple and the principles of Sikhism. The temple not only provides a place for prayer, but also provides free meals for visitors. 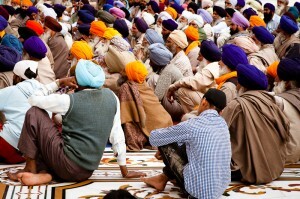 One of the beliefs of the Sikhs is that all people are equal – a man who stopped to chat with us explained that no matter how important a person was it was expected that they sit down and eat with everyone else. 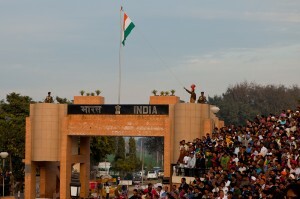 In the afternoon we left to see the daily ceremony marking the closing of the border between India and Pakistan, otherwise known as the Wagah Border. We were surprised that a flash of our Australian passports meant we were VIPs and were seated in an area with a good view of the gates at the border. The ceremony was an incredible display of patriotism between both sides. The stadium on the Indian side was packed full of people cheering and chanting as people danced and sang on the road. Once the last bus had made its way across the border, the soldiers of either side took part in an impressive and competitive march. One particularly entertaining aspect of the ceremony was a performance between the soldiers of either side to determine who could vocalise a tune for the longest possible time on one breath. Before closing the gates for the final time, the flags of both countries were lowered and the soldiers on either side of the border shook hands. Your weblog never ceases to amaze me, it really is extremely well written and organized. Sure thing, as long as you link back then please go for it! Do you mind basically if I refer to two of your current blogposts provided that I provide you with acknowledgement and additionally sources returning to your blog? My world wide web site is in the exact same niche as your own and my site traffic would certainly make use of most of the strategies and information that you provide here. Please don’t hesitate to tell me if it is okay with you. Cheers! Good info. Big thanks for that.